Is it really that bad having a picture of yourself drunk on Facebook? I’m rarely particularly troubled by guilt over this in my personal life, but by god, this question comes up again and again in the media. It’s all “SHOCK HORROR A Person Has Some Drinks at the Weekend, Here’s Proof. OMG”. Can I just clarify to the media, that alcohol consumption is socially acceptable in the UK. In many circles it is positively encouraged – you know – “work drinks”, “birthday drinks” etc. As many people enjoy drinks and most people nowadays photograph themselves and their friends several times a day and often put the results on social networking sites, if I see a picture of someone on a night out, I am neither surprised nor shocked if there is a bottle of beer in their hands. Unless you’re one of those naked drunks or you’re an anti-alcohol campaigner, it’s just not that big a deal if there’s a picture of you drunk on Facebook, IMHO. While some of the results are in line with previous studies we’ve read, others simply shocked us (e.g. 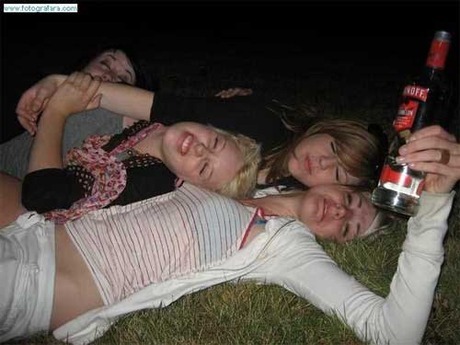 42% of young women think posting photos of themselves “visibly intoxicated” is okay). You know what? Most people’s parents probably do know they drink. I’m not going to repeat this point again. I am going to lay into Mashable though – cause I detect a hint of some patronising male attitudes in there: two in fact. A bit of the old “oh those silly 18-34 year old women, don’t they know what’s good for them”; and, number two – the idea (implicit, not stated) that it’s more shocking to see a woman drunk than a man. Those people can go back to the 1950s. And let me tell anyone in doubt here, there are lots of pictures of drunk men on Facebook. No one asked your boss to go looking at your Facebook profile anyway, & what the hell did he expect to find? photographs of you poring over spreadsheets and motivational business books with your friends in your spare time? People who do care will just make their pictures private. Okay so I’m part of the “Live Out Loud” generation and sorry if you don’t want to hear about it, but in the immortal YouTube retort: “if you don’t like it why did you watch it?”. Looking for the next big idea in tech? Ask your seven-year-old.. This article takes a deeper look into outstanding performance. Only want to say your article is awesome. It will be always better if someone will try to leave up drinking! These guy’s looks happy but drink is not good for health. Social media like this type news. so people update news and picture in this site. Why the media want to grow up this news, i also upset to read this news. I believe in the spirit of what your article says. In a perfect world, we’d be able to post anything we wanted on Facebook and not face consequence for it. Our bosses, teachers, etc. would respect our right to live our lives on our own time the way we wanted and everything would be great. However, this isn’t a perfect world. Bosses, teachers and parents do check people’s Facebook profiles and photos and do use anything of a questionable nature they find on them against the people who posted them. I’ve heard of college students getting busted for underage drinking and of people being fired because their bosses found photos of them on Facebook drinking or using drugs. Remember what happened to Michael Phelps last year! So the bottom line is until either the laws or people’s attitude toward privacy and private life change, it’s best to protect yourself and make certain that you don’t leave stuff like that out in open view to be used against you. Yah i also think that, if those people have drunk, so just leave it, why media publishing this issue. There is nothing wrong in putting those drunk photos on facebook. Media is just making a mountain out of a mole hill. I once joined a major police department. One question they asked during a background check questionnaire was “Have you ever smoked marijuana?” Everyone in the 1960’s and 70’s smoked pot at least once. So why is this a big deal? After I was in management I discovered that if you answered yes you were penalized for being stupid and answering yes, not for actually smoking the stuff. The same principle applies here. If you are indiscreet enough to post a drunken or compromising photo of yourself online, you may not be what a company is looking for as an employee. We all get drunk but we don’t brag about it in public if we want our professional reputation intact. In a world where I can get 100 good candidates for each job, why take someone with less than perfect discretion?